Over the last couple of years, it seems that every Christmas season brings a new blues compilation. If you're at all interested in the blues and want to buy an introduction to the music, there are a half-dozen good collections available. But what sets this collection apart is the historical education it provides the listener while also entertaining. Its chronology begins in the late 1920s, and stretches through the 1960s, taking in artists from Pine Top Smith to B.B. King, Alberta Hunter to Muddy Waters, Peetie Wheatstraw to Bobby "Blue" Bland, Louis Jordan to Albert Collins. 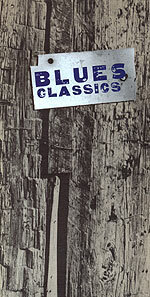 Included here are the original recordings of classic blues tunes like "Stack O'Lee," "Kansas City," "How Long Blues," "Tight Like That" and "Trouble in Mind"  songs that have been recorded and re-recorded dozens of times, songs that have become the canon of the blues, the repertoire every blues artist has to know to prove her or his chops. Hearing them in their original, often stark and stripped-down versions gives one a new appreciation for the interpretations that followed. The three discs are accompanied by a 62-page booklet with biographies and photos of nearly all the artists, recording info, and history of the MCA labels. While not a comprehensive look at the blues, "Blues Classics" is a fairly complete history of the blues with many of the greatest recordings and artists of the style. It's as good an introduction to the music as there is.